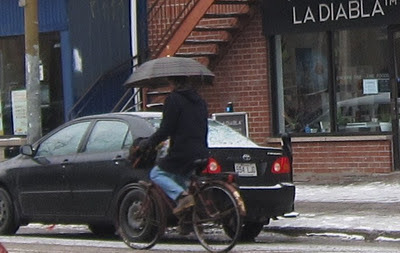 Cycle Fun Montreal: bike... umbrella? This is not a recommended cycling accessory. But for those adept at one-handed cycling (and braking) this is one way to beat the weather. I would never try that! I wish I was that insouciant a cyclist. But I'm just too serious. Indoor winter cycling - why not in the big O?